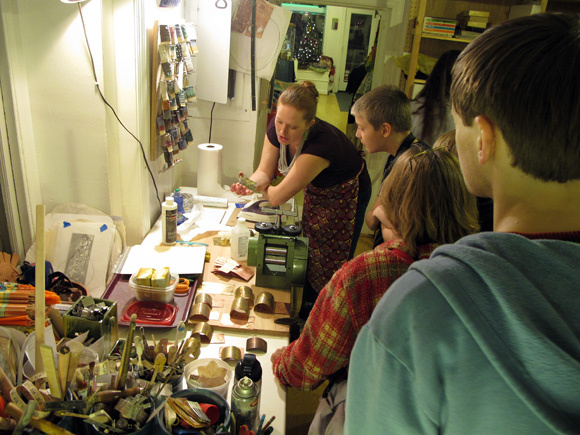 December 7, 2012: PONSHOP hosted their second annual jewelry show featuring works by 11 jewelers. The opening reception included live demonstrations by Leslie Brier, Susan McLay, Jeff Gulick, Lisa Latendress, and Erica Voss. Many of the other featured artists attended the show and were on hand to answer questions including Silvia White, Terresa Buelow, and Zakk Davis. Below are some pictures from the evening. On behalf of Scarlett and I, thanks to all the fans that came out to the show that evening and thanks to all of our talented jewelers and artists for sharing. The jewelry show is on exhibit at PONSHOP through December 30th. PONSHOP Studio and Gallery are pleased to announce that they will be hosting the second annual jewelry show for the month of December showcasing the work of eleven jewelry artists. In keeping with the gallery’s format, all jewelry works on exhibition are original pieces handmade by local artists. The exhibit will feature a wide variety of materials including upcycled items, beads, leather, ceramics, sterling silver, hand-colored resin, precious metal clay, as well as bullet casings. The jewelry exhibit features the works of Leslie Brier, Terresa Buelow, Cirello Jewelry, Zakk Davis, Jeff Gulick, Nicole Hart, Lisa Latendress, Susan McLay, Scarlett Pons, Erica Voss and Sylvia White. The exhibit will offer a wide price range of jewelry starting at twenty dollars. The opening reception will include live demonstrations by Leslie Brier, Jeff Gulick, Lisa Latendress, and Erica Voss. The gallery walls will include a group exhibition of featured PONSHOP artists including Nicholas Candela, Stephen Graham, Adam Desio, Jeremy Gann, Bill Harris, Ginger Huebner, Rob Landeck, Scarlett and Gabriel Pons. "Intro to Street Art" has been one of the most popular workshops this summer. In three 1.5-hour sessions, students were given instruction on how to design and cut their own paper stencils which were then sprayed onto a 24"x24" masonite board. Congratulations on a job well done! Step aside R2D2, there is a new robot in town... or shall we say robots! Instructed by Leslie Brier, students went out of this world when they came up with these awesome designs creating unique robots using a variety of recycled materials. Check out these mechanically inspired works of art in the gallery below. Want to make your own? Click here to view our class schedule. PONSHOP will be bringing back the much anticipated T-Shirt Showcase as “Tailor-Made 2” this August with new designs and artists. The opening reception will be held during “First Friday” August 3. This exhibition will feature screen-printed shirt designs from PONSHOP, Nightmare Inc., Icy Grape Incident Clothing and Somaphony. This is a unique opportunity to see the original graphics adorning the walls of the gallery. PONSHOP offers house brand art tees screen-printed with signature graphics derived from the original paintings of owner, Gabriel Pons. They will be premiering a handful of new t-shirt designs for men and women. Nightmare Inc. Apparel is a clothing company based in Fredericksburg and established in 2008 by Massaponax High School graduate, Ryan Payne. With strong ties to horror and bedtime terrors, you'll be daydreaming of ways to get this brand. Icy Grape Incident Clothing brings original graffiti inspired artworks to high quality t-shirts. Owner, Tony Sementelli joined a few of his fellow local artists 2 years ago on a journey to launch their own clothing line and never looked back. Somaphony joins us from Washington, D.C. with artist Nate Lewis as the leading contributor. Inspired by the Greek words “Soma” and “Phony”, meaning body and sound, his designs fuse human anatomy and musical instruments as wearable art. Starting with simple drawing techniques, these students created works to visually express themselves using pencils, markers and other media. Instructor Gabriel Pons gave the students exercises in Map-making, Gesture Sketching, and light and shadow study. 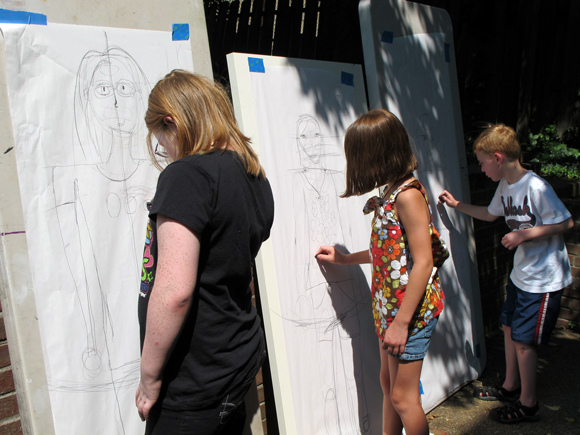 In their last session, students drew complete life sized self-portraits! These children showed incredible patience and ability throughout the workshop. Congratulations! 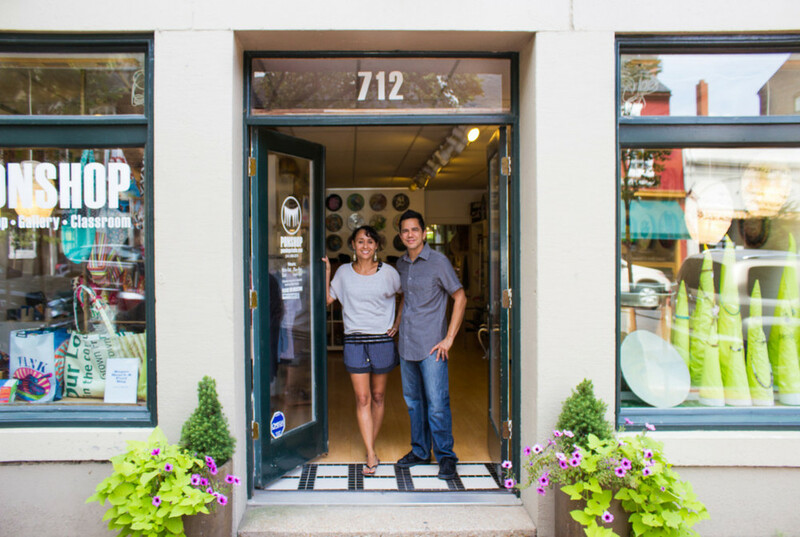 PONSHOP celebrates summer by opening their outdoor “garden space” to the public. This “First Friday” of July from 6-10pm will be the kick-off of the Summer Exhibition. July’s show will include the latest paintings and skateboard designs by Gabriel Pons as well as recent ceramics work by Scarlett Pons. Featured artists for the month include painters Julie Maida, Nicholas Candela, and Jeremy Gann as well as photographs by Adam DeSio and Stephen Graham. The gallery also features fresh work from local jewelers Leslie Brier, Terresa Buelow, Lisa Latendress, Jasmine, Susan McLay and more. PONSHOP will open their backyard as an event space with DJ Max spinning some artfully choreographed tracks throughout the evening. There will also be a live painting demonstration by Gabriel Pons in the garden. July also ushers in a new series of art classes ranging from ceramics and painting to architectural drawing, photography, recycled crafts and jewelry design to name a view. For a current class schedule, visit the PONSHOP online. PONSHOP is excited to welcome a new-featured artist, Julie Maida, to the gallery. Creating everything from functional home goods to prints and paintings, her use of strong colors and elegant line work are sure to enhance any space. Also in the gallery are works from owners Scarlett and Gabriel Pons as well as signature paintings by Joshua Barber, Nicholas Candela, Jeremy Gann, and Ginger Huebner. Bringing an original touch to photography, Adam DeSio and Stephen Graham will have their latest images on display. Join us Friday, June 1st from 6-10pm for a special evening of local art and enjoy the company of art lovers alike.